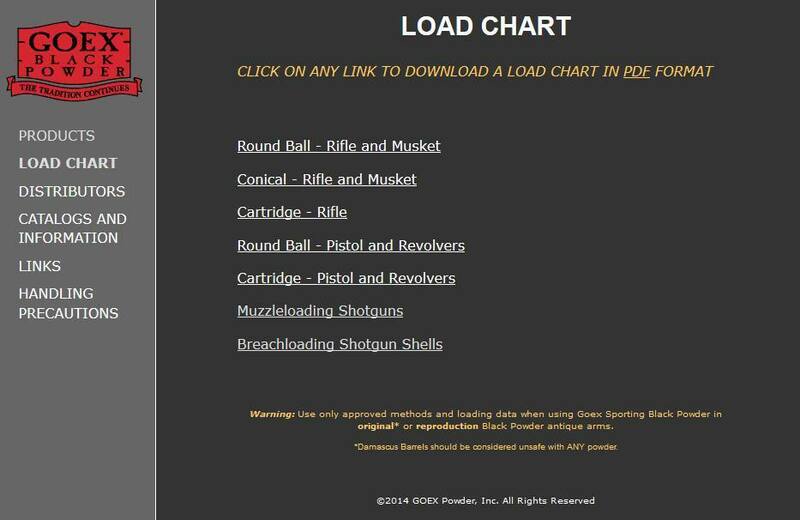 Goex / Hodgdon considers all Damascus guns unsafe. #shotgun, he is told not to shoot it. For good reason... They tend to come apart like a cheap suit. #factory or handloads) through such a shotgun? advanced age of the shotgun sets the stage for disaster. he went ahead and shot it anyhow. Now he is paying the price. Why Damascus welded barrels were doomed by their very nature is discussed here. 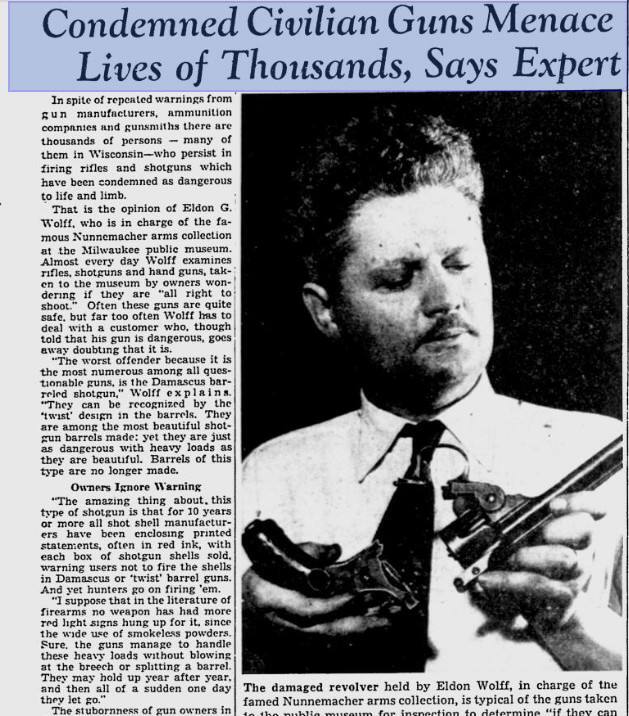 "A good many people resent being told that their much loved old guns were no longer safe. 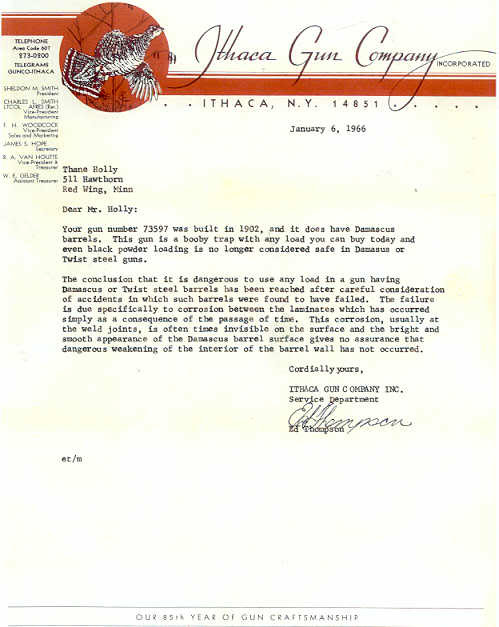 Just for the fun of it, Lou Smith (President of Ithaca Gun Co.) proofed (using 17,500 psi Proof Loads in 1942) a dozen or so damascus and twist beauties which were lying around the plant. Here's the dope: Most of the old timers busted loose with the first proof shell. The rest did with the second. Guns tried were cheap, medium priced and expensive: but all of them went. So if anyone wants to go ahead using modern smokeless stuff in a gun built for black powder, he can; but he can include me out." -- Jack O'Connor, 1942. There was a fairly recent lawsuit against an ammunition manufacturer. The customer was told that no, there was no guarantee that the ammunition was safe in his gun unless the individual went through appropriate and costly testing. The owner then decided to do his own "proof-testing," firing seven rounds with his gun in a fixture. The eighth shot was from his shoulder. The gun failed, and the shooter lost his left arm in the incident. He sued. He lost his lawsuit. "Safety First, and then have a good hunt!"